Japanese woman with cloggs in traditional Japan costume. Home » Japanese woman with cloggs in traditional Japan costume. 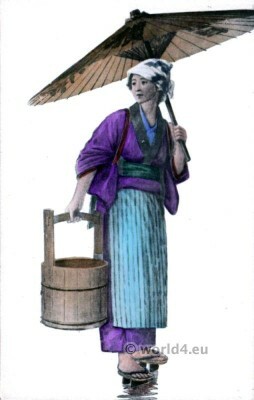 Japanese woman with cloggs and parasol carrying water. Japanese woman carrying Water, Parasol. This entry was posted in 10s, 20th Century, Asia, Japan and tagged Traditional Japanese costume on 12/5/14 by world4.